Here you will find songs by Senescence. Most are originals composed and interpreted by Senescence. Although I make an effort to produce quality songs, please consider them as demo songs since they were recorded with limited equipment and funds. Besides, I play all instruments and I am responsible for the mixing and mastering of all the tracks, even though I am only an amateur musician. All these songs are copyrighted. As described elsewhere, they may be freely distributed non-commercially as long as the files are not modified in any way. Particularly, please assure that the copyright and authorship information remain visible. By downloading any MP3 files from this website you agree to these conditions. I wrote this song about losing my wife, who had passed away the year before. I play it on the classical guitar she gave me as present. The lyrics are very sad, although I tried it to end on a positive note. This is my first original song in nearly 7 years and it reflects the way I've changed in that time. I'm more mature now, more able to control my anger. Accordingly, the song is less aggressive than my older tracks. On the other hand, the melodies and solos still preserve my folk and classical influences. I've been living in the US since 2004 and this song tells about my journey as an immigrant, including a critique of American culture. I've always felt that the first version of this song (see below) dragged on for too long. In this new instrumental version, I made a shorter, more medieval-style song that lacks the metal power of the original while keeping the harmony and atmosphere. One of my favorite classical songs that is a pleasure to play in the electric guitar. My 1999 Album "The Legend of Hrothgar"
"The Legend of Hrothgar" is pretty much impossible to find and, being an independent album I produced and published, I decided to put it online. At the time I made this album, I used Dark Angæl as my artistic name. It's an amateur production, though. 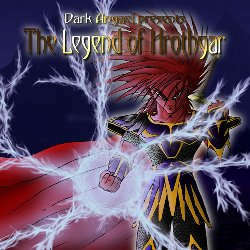 Overall, "The Legend of Hrothgar" is probably best classified as a symphonic metal album. It features so many different types of songs, however, that this it is difficult to label it as a single genre. Metal is predominant, particularly melodic and power metal, but it has classical, medieval, and even folk, rock, and grunge influences. My favorite songs are tracks 3 and 9. With exception of the female vocals, I'm responsible for all sounds in the album, mixing and mastering. I wanted the first song of my album to be epic, combining medieval music and metal. The lyrics are about an army at the gates of a legendary city called Yvdar. It's a song about preparing oneself for combat and to fight for one's dreams. The song has some nice melodies, though it drags a bit at times. Recently, I made a shorter instrumental version (see above). This is a death metal song that combines heavy distortion with harmonious interludes and melodies. I wanted to create something along the lines of "Tales From the Thousand Lakes" by Amorphis. The first song I made when I was sixteen. It's all acoustic, very sad, but I find it beautiful. I'm proud of this song because I started working on it with pretty poor riffs and I still managed an enjoyable song. The title comes from when I was thinking of a title for the song but couldn't think of anything; I therefore thought I was searching for something that did not exist. The lyrics are weird but mainly are a hymn to combat and determination for one to achieve one's goals. The music is a mix of symphonic metal and hard rock. A blend of acoustic guitar and synthesizer sprinkled with heavy distortion here and there. This song is a bit reminiscent of old medieval and folk music, a sort of folk metal. I only sing a bit in the beginning, so it's mostly instrumental. This song is about a prophecy that claims an army will come from the north and conquer all the land. It's one of my fastest songs but it also shows my classical and Celtic tastes. "Nordens Drenge" means "boys of the north" in some Scandinavian languages. A technically simple song with dark, melancholic lyrics over slow, sad tunes. Indescribable, completely different from everything else. A power/symphonic metal song where I experiment different styles and techniques. The lyrics are a story set in the Roman Empire in which a young children is hidden from the Emperor to prevent the child from becoming Caesar. I wanted to experiment a bit with blues in this song. In addition, my cousin, Nuno Garcia, was kind enough to let me use some of his material that I really liked. It doesn't sound a lot like blues in the end, yet the mix of dark melodies and acoustic arpeggios make it an enjoyable song. The lyrics are a poem to the gods of the storm. Apart from "Planet Hell", this is probably my album's favorite song. A slow, mainly acoustic, song with a strong Spanish influence. The synthesizer part at the start and end is quite beautiful, though the song drags a bit in the middle. The lyrics are about the conquest of the New World by the Spanish. This is probably the worst song of my album. I was trying to create a mystical power metal song, but I think I got carried away in my experiments. Maybe I tried to be too original. Considering that there are actually some nice melodies and riffs in it, I could try to make a new version at some point. All songs in "The Legend of Hrothgar" copyright © 1999 by João Pedro de Magalhães. Some rights reserved. Copyright © 1999, 2005, 2006, 2017 by Senescence. Some rights reserved.